One of TV's most acclaimed drama series, the Emmy®- and Golden Globe®-winning Six Feet Under concludes its groundbreaking, five-season run on HBO this summer with 12 all-new episodes. 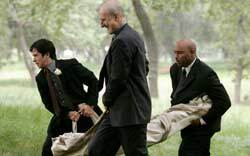 Created and executive produced by the Oscar®-winning writer of American Beauty, Alan Ball (also an Emmy®-winner for this show), Six Feet Under continues to focus on the cathartic journey of the extended Fisher family, whose personal trials and tribulations are played out against the solemn backdrop of an independent funeral home in LA. This season, story elements established in the first four seasons reach a series of emotional climaxes, with Ruth overwhelmed by her mentally fragile husband George, Nate struggling to reaffirm his relationship with Brenda while raising his daughter Maya, David and Keith longing for children of their own, Claire trying to broaden her horizons, and Federico attempting to fill the void left by Vanessa. By season's end, each of the main characters will come to embrace the cycle of life - birth, death, and rebirth - in ways that are both unique and interconnected. New Season Five directors include Mary Harron (HBO Films' The Notorious Bettie Page) and Joshua Marston (HBO Films' Maria Full of Grace), with SFU executive producer Alan Poul returning as a director, and creator Alan Ball slated to direct the series finale. Season Four received raves from The Wall Street Journal ("...the best drama ever on television, a work of art"), The Boston Globe ("continues to unearth brilliance..."), Newsday ("...masterful...refreshing..."), and Washington Post ("the perfect drama...fascinating...").